Ready to fuel up for the big game? After Thanksgiving, the Super Bowl is the second largest day of food consumption in the United States. Most of these traditional football foods are unhealthy and packed with calories, so we've put together a list of our favorite skinny appetizers that won't leave you feeling like you just got tackled! Go ahead and try these recipes for the big game. People won't know if you're cheering for that touchdown or for the food! 1. 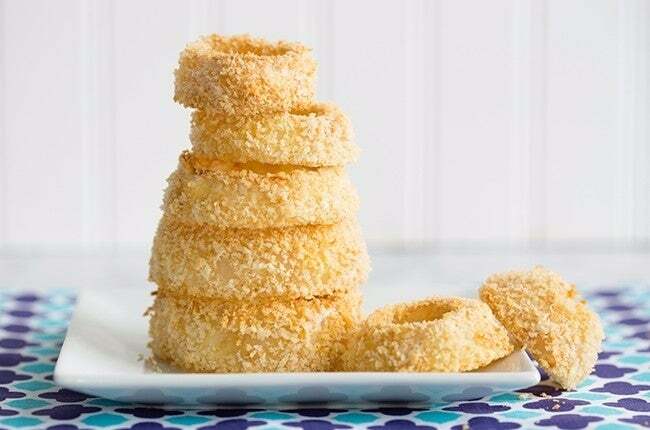 Baked Onion Rings: You can skip the guilt when you skip the fried food! These onion rings are baked to make them healthier and they still taste AMAZING. Try them out on your friends and see if they'll notice! Click here to see how they're made. 2. 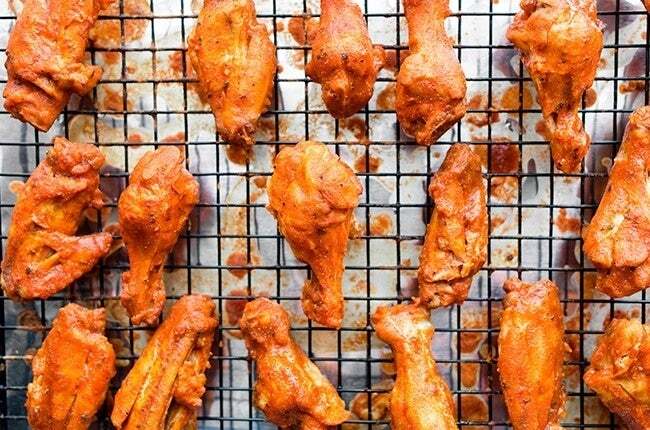 Skinny Buffalo Chicken Wings: We've taken this classic recipe and held onto its flavor while ditching the calories. You can have six chicken wings for UNDER 200 calories. Don't believe us? You can see the nutrition here. 3. Cauliflower Pizza Bites: Get your snack on while giving your body a dose of its daily veggie requirements! 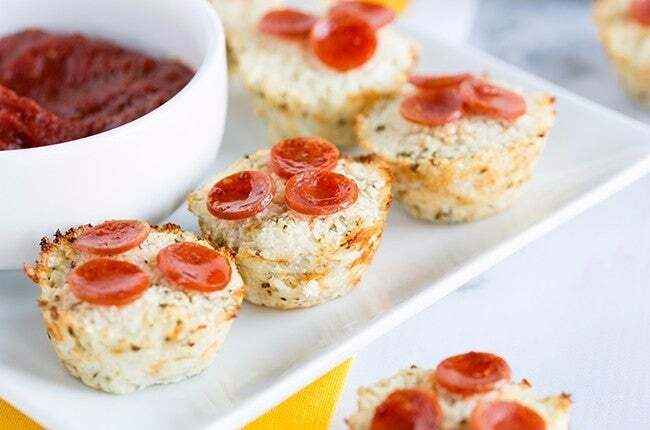 These bites make for a great mid-game snack because they are all the fun of pizza without the unhealthy ingredients. Check 'em out here. 4. Simple Skinny Queso: Don't sacrifice calories for the ease of a jar of cheese! 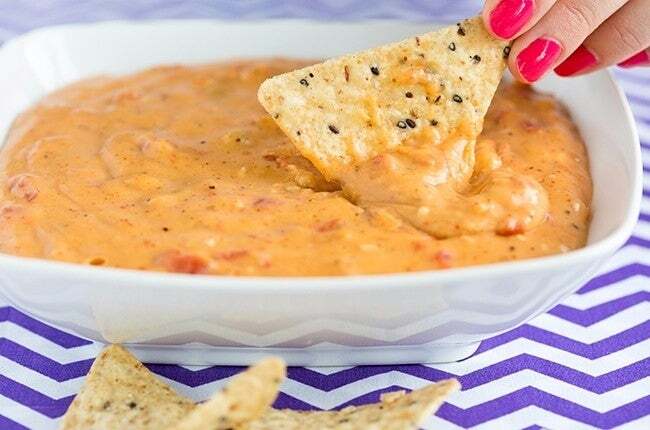 This homemade queso is as easy to make as it is to eat! You and your friends will love this snack. You can see the full recipe here. 5. 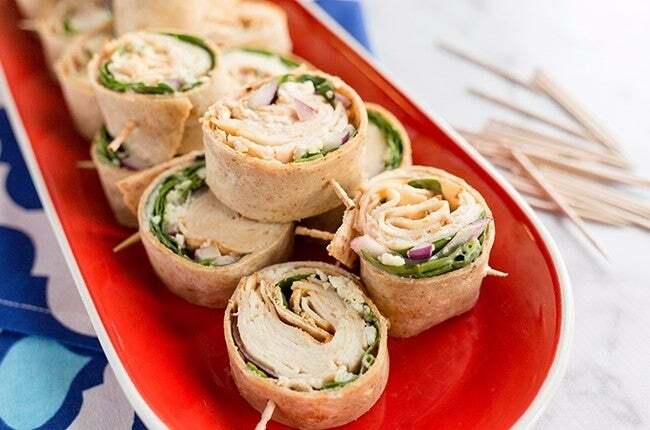 Buffalo Chicken Pinwheels: Classy, easy to eat AND skinny! This recipe is great for game day and girls' night in. Serve it up to every guest and they'll never know how many calories you're saving them. Click here for recipe details. 6. Baked Crab Rangoon: This classic unhealthy appetizer gets a skinny upgrade with a healthier baked version! 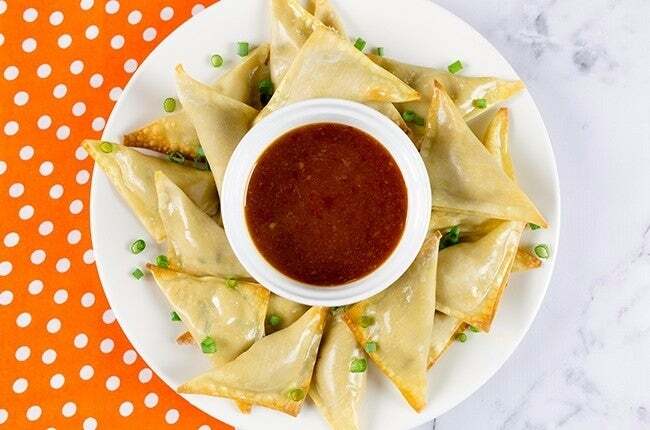 Your guests will love chomping down on these Asian bites of goodness, and at no cost to their waistlines! Check out the recipe here. 7. Zesty 5-Minute Guacamole: If you're headed out to the Big Game's party and just realized you forgot to make a dish to bring, this is the perfect recipe! It's skinny, easy and fast! See how it's made by watching the video or clicking here. 8. Copycat Chick-fil-a Nuggets: You could cater in a greasy tray of nuggets or you could bake a batch that tastes just as great with way less calories. The choice is easy! You'll love this recipe so much you'll wonder why you ever bothered with a drive-thru and you're guests probably won't know the difference! Click here to see our recipe. 9. Skinny Hawaiian Chicken Cups: These are a great way to get big flavor in a small bite! 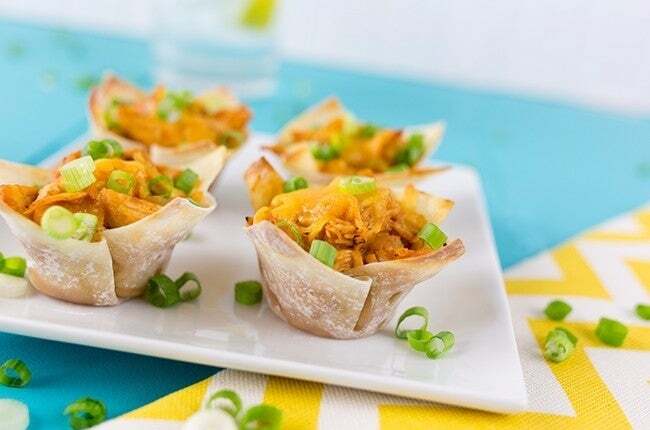 This cute wonton chicken cup appetizer won’t ruin your meal, and will be a hit at your next backyard BBQ. At 133 calories per serving, that adds up to only 67 calories for one prepared cup! Get our recipe here. 10. BBQ Bourbon Glazed Meatballs: Bourbon glazed meatballs that are waistline-friendly? Sign us up! This flavorful, juicy recipe is slimmed down by using turkey meatballs instead of beef, while still letting bourbon be the major flavoring agent. 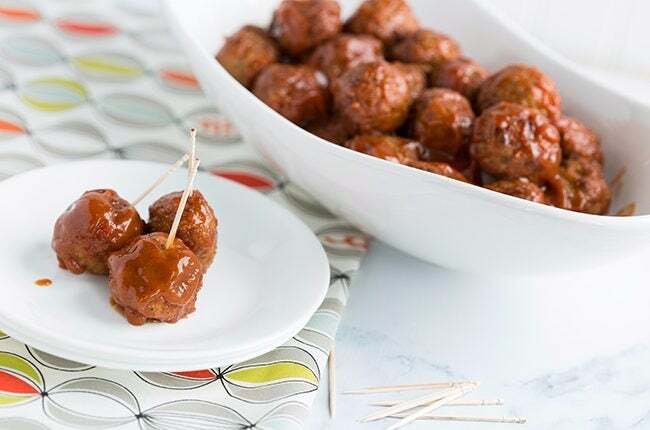 Worcestershire sauce, reduced-sugar ketchup and apple cider vinegar come together for an incredible sauce that covers the tender, bite-size meatballs. Clocking in at only 182 calories for 6 meatballs, this will be your favorite tailgate dish for years to come. See the full nutrition info here. 11. Skinny Spinach and Artichoke Dip: A favorite appetizer of many, treat yourself to this creamy dish and feel no guilt at all with only 78 calories per serving. Scoop it up with some whole-wheat pita bread or fresh veggies. Get the recipe here or watch the video below! 12. 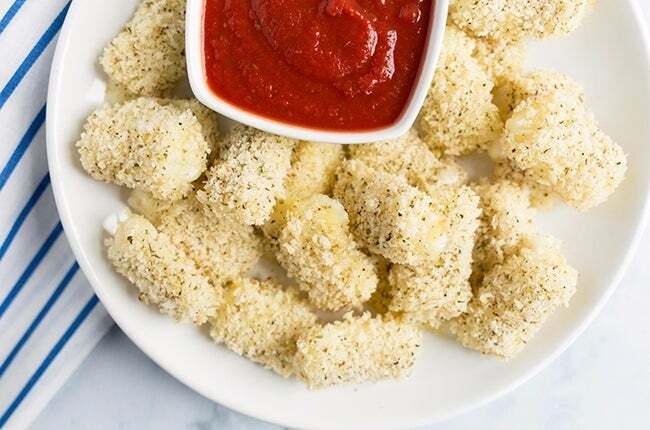 Skinny Mozzarella Bites: Hello, delicious! These Skinny Mozzarella Bites are too good (and easy) not to try! Don’t be surprised if the results have you popping a second batch in the oven right away! They are a great afternoon snack and they're perfect for the Big Game! Check them out here. 13. 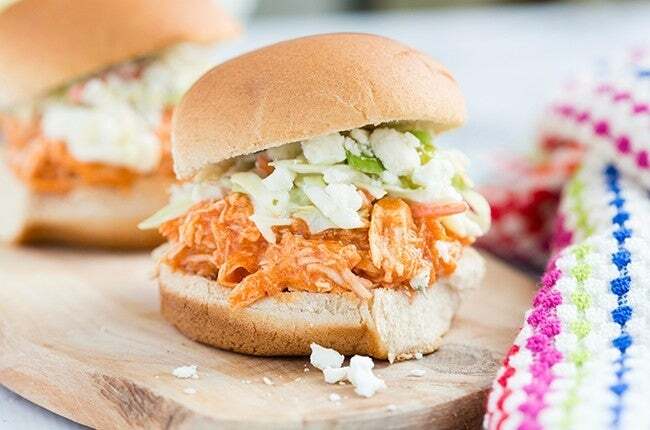 Slow Cooker Buffalo Chicken Sliders with Celery Slaw: These Slow Cooker Buffalo Chicken Sliders are the perfect addition to your game-day party. Bite-size and adorable, your guests will devour them at 150 calories a piece. The celery slaw adds the perfect crunch to the juicy and flavorful Buffalo chicken, while the blue cheese and ranch are the the perfect cool-down combo to accompany the hot wing sauce. If you have any leftovers (chances are you won't! ), pack them for lunch the next day either on extra slider buns, or even in a whole-wheat pita. If the slaw is all gone, just cut up some carrot or celery sticks to dip in ranch. See the recipe by clicking here. 14. Skinny Mini Turkey Burgers: Easy to make and easy to eat, these little burgers are perfect for tailgaiting! They are great to serve up to your husband and 5-year-old kiddo alike! Click here to learn to make them. 15. Skinny BBQ Chicken Kabobs: It's never too early to fire up your grill! These chicken kabobs make for a great appetizer to serve your guests. Try serving them alongside our Skinny Barbeque Sauce to keep it skinny! Get recipe details by clicking here. 16. Turkey Meatball Sliders: This recipe is going to forever rid the notion that slimmed-down meals lack flavor. These Turkey Meatball Sliders are savory, juicy and, best of all, totally healthy! See how they're made by clicking here. 17. Skinny Taco Stuffed Peppers: These aren’t your grandma’s stuffed peppers packed with beef, rice and ketchup! Instead, fill these up with delicious ground turkey, salsa and cheddar cheese and you’ll have a bold burst of flavor in every single bite! See the nutrition info here. 18. Skinny (Gluten Free) UN-Fried Chicken: A crispy, crunchy, seasoned crust with soft, delicious, perfectly cooked chicken inside… We just don’t think it gets much better than that! You can click here to make them for yourself! 19. Cauliflower 'Breadsticks' with Marinara Sauce: Before telling your guests they're about to eat cauliflower, see if they notice! This is a tasty snacks the doesn't taste nearly as healthy as it is. Learn to make them by clicking here. 20. Cheeseburger Meatball Skewers: This fun appetizer is sure to be a crowd pleaser! Your family and friends won’t even miss the bun because they’ll be too busy devouring these low-calorie mini burgers. In fact, three of these bad boys has only 144 calories! Click here for cooking instructions. 21. Baked Broccoli Tots: Resembling a childhood favorite (tater tots), this is a healthier take on the fried potato snack, baking (instead of frying) fiber-rich broccoli. Five of these irresistible tots is only 129 calories and 6 SmartPoints, so get chomping! See the recipe here or watch the how-to below! 22. Skinny Fish Sticks: Who doesn’t love the taste of a good, deep fried fish stick? Well, rather than deep frying these scrumptious sticks, we used a skillet with a touch of canola oil so you can enjoy the same crave-worthy taste without all the added fat and calories. Show them off to all of your guests with our skinny recipe. 23. Buffalo Chicken Bites: Made with shredded chicken, these bites will soon become your favorite new appetizer! Adjust how much hot sauce you add to customize it to your tolerance! Get the recipe here. 24. Ultimate Pizza Quesadilla: Don't order a pizza on game day! Whip up these quesadillas instead. They are full of pizza flavor but not full of calories. Get the list of ingredients by clicking here. 25. Skinny Taco Chicken Chili: If you're entertaining guests, you don't want to spend the afternoon in the kitchen. Instead, throw everything together in a slow cooker and enjoy game day while it cooks for you! Your guests will love this lean chili. You can get the recipe here. 28. Light Egg Salad: Our low-cal, low-fat egg salad recipe will be a hit at your next get-together! We use Greek yogurt in place of mayo to cut down on calories and fat, while going back to the basics and letting sweet relish, mustard, dill, and — of course — eggs shine through. See our recipe here. 29. Baked Hummus and Spinach Dip: This is not your average spinach dip! This a totally unique, yet simple, vegetarian appetizer or party snack that your friends will be raving about! Check it out here. 31. Skinny Baked Sweet Potato Chips: Love the crunch of potato chips but hate the calories and fat that come with them? A serving of these sweet potato chip, however, contains only 71 calories and two grams of fat — and that’s for 20 chips! Click here to learn to make them or watch the video below. 32. Skinny Taco Dip: This dish basically screams, "It's time to party!" We always hear rave reviews from everyone who tastes it. Your friends and family will be begging you for the recipe after they try this delectable dip! Click here to be taken to the recipe. 43. 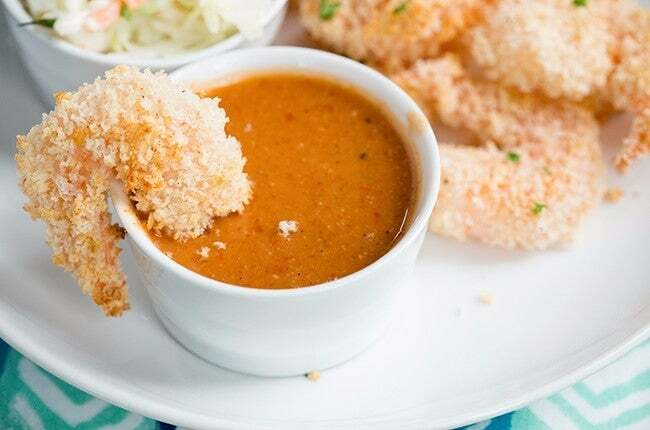 Crispy Oven-Baked Shrimp: This Crispy Oven-Baked Shrimp is not fried at all — just dipped in egg whites, bread crumbs and seasonings — but it's so good that your taste buds won't know the difference. Plus, the Smoky Cocktail Sauce is unlike any shrimp cocktail you've ever had! This super simple recipe will be a hit at your next get-together. Click here for the recipe. 44. 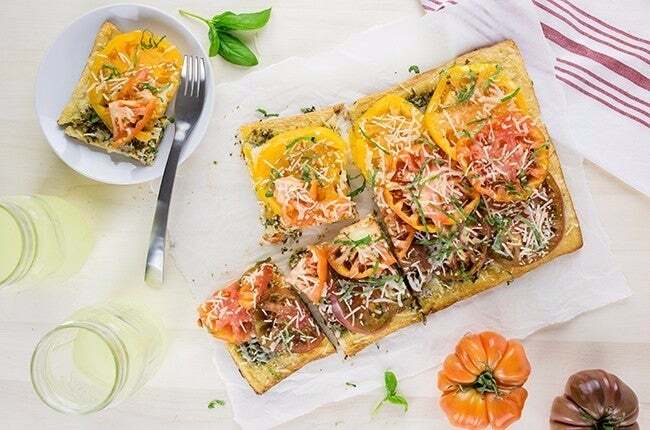 Heirloom Tomato and Pesto Tart: The good news is that this Heirloom Tomato and Pesto Tart super easy to make and only 165 calories per serving, so you can indulge in seconds without feeling guilty! Get the full recipe here. 47. 5-Minute Garden Fresh Salsa: Quick, healthy and full of flavor, this salsa is perfect for any watch party, a girls' night or just a quick snack! Your guests will love the fresh flavors of this dip. Get our recipe here and watch the how-to below!